Before the credits even roll in Strait-Jacket (1964), a narrated flashback provides all the background information we need to know. It starts with Frank Harbin hooking up with ex-girlfriend Stella while his wife Lucy is out of town. Frank takes Stella back to the farm for some hanky-panky, even though his daughter Carol is there (and not asleep). Lucy returns early, of course, and peeks through a window to see Frank and Stella asleep in bed. 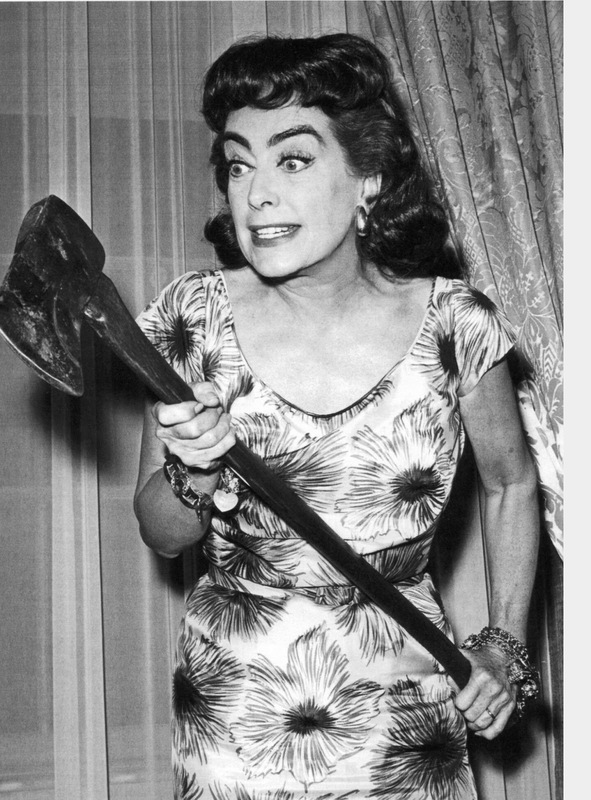 So, she picks up the ax planted in a nearby stump, enters the house, and slaughters the couple while daughter Lucy looks on. Twenty years later, an adult Carol (Diane Baker) greets her mother Lucy (Joan Crawford), who has been released from an asylum. Carol, a sculptor, lives with her aunt and uncle who have raised her. She is "almost engaged" to nice guy Michael. She realizes her mother faces a difficult transition to "normal" life. As Lucy peers into the chicken coop, she remarks: "I hate to see anything caged." 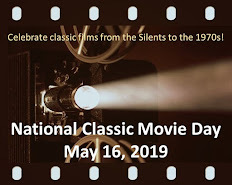 Written by Robert Bloch, who penned the novel Psycho, Strait-Jacket is one of the many B-suspense films produced in the 1960s--mostly by William Castle or Hammer Pictures. This one is a Castle production and, while it pales next to his classic Homicidal (1961), it provides a juicy role for Joan Crawford. She is quite effective as the unbalanced Lucy, who shifts from withdrawn former patient to protective parent to confident, flamboyant woman (who awkwardly comes on to Michael in front of Carol). 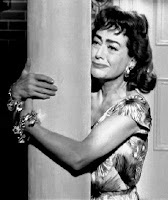 One suspects that Crawford was surprised when bigger roles didn't come her way after What Ever Happened to Baby Jane? scored big at the boxoffice. She began filming Hush...Hush Sweet Charlotte, but was replaced with Olivia de Havilland (read this Vanity Fair article for more details). She subsequently signed with William Castle to do two pictures: Strait-Jacket and I Saw What You Did (1965). William Castle is probably best-known as a prolific B-movie producer and for introducing gimmicks such as the life insurance policy given to viewers of the "frightening" Macabre. However, he was also an above-average director, as evidenced by Strait-Jacket. His scene transition from sculptor knife to carving knife shows some Hitchcockian style. The dark slaughterhouse, where two victims meet their ends, provides a stark contrast to the brightly-lit farm. An unhinged Lucy casually striking a match on a record on the turntable is a brilliant touch (it has been clipped for YouTube...more than once). Naturally, Strait-Jacket features a twist ending, though I doubt if it will surprise many viewers. I must say, though, that it leads to a great scene for one cast member. Incidentally, Joan Crawford and Diane Baker also played mother and daughter in the same year's Della. They were also guest stars (separately) in back-to-back episodes in the fourth season of Route 66. In Joan's episode, "Same Picture, Different Frame," her character was stalked by a homicidal ex-husband just released from an asylum! Diane Baker was Crawford's protege. She had Anne Helm fired to replace her with Baker. Crawford herself replaced Joan Blondell. Castle beheads the Columbia Studio Lady logo before the credits. The poor Columbia lady still has no head in the closing credits, too. Castle does not behead the Columbia Lady in the opening logo of Straitjacket. The CL only appears as such at the closing fade. You’re right. In the print shown on TCM, she’s only missing her head at the end. An odd little touch, but that was William Castle. When I watched this recently it was with equal parts the chills it gave me when I was young and appreciation for big ideas on a small budget. I know Diane Baker from lots of things. She got to play some very notable roles including Nick Barkleys fiancée on The Big Valley and Richard Kimbles last love interest on The Fugitive. 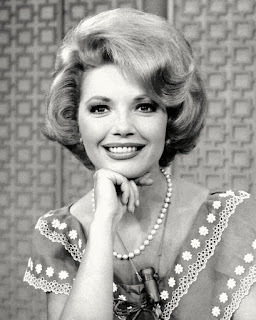 She was a guest star on Murder,She Wrote with Foster Brooks and Tess Harper. She worked with Sean Connery and Tippi Hedren in Marnie. Not sure I'll be catching this one, but I can only imagine how perfect Joan Crawford's performance is.